Welcome to Chicago Martial Arts. NO JUDGES, and NO TIME LIMITS or ROUNDS! The only way to defeat your opponent was to either knock them out or make them submit or give up. Royce Gracie, the representative for Gracie Brazilian Jiu Jitsu, defeated his opponents by neutralizing there striking, obtaining a clinch, and taking them down to the ground where he would then force them to submit by either applying a joint lock or choke hold, rendering them unconscious. What was most impressive is that Royce was almost always the smaller man and would sometimes defeat much bigger, heavier opponent without throwing a single strike. Proving that Gracie Brazilian Jiu Jitsu in fact was a martial art style that gives a smaller, weaker person the technique and ability to beat a much stronger, heavier opponent. In 2000 , Eddie Redzovic became the lead instructor of the Gracie Academy affiliated school in his hometown of Chicago Illinois. Eddie and his brother Adem understood that if they were going to get a deeper understanding of the art, they would need to go to Brazil to study with the best Instructors in the world. It was in Brazil where Eddie met his teacher, Master Carlos Gracie Jr. Eddie and Adem were given the honor of becoming the first American representatives of Master Carlos Gracie Jr. in the United States. Eddie was also given the honor of being one of the first Americans to receive the rank of Black Belt from the hands of Carlos Gracie Jr. When the family was not traveling to learn the gentle art they would regularly fly out world renown professors and fighters to continue their education. 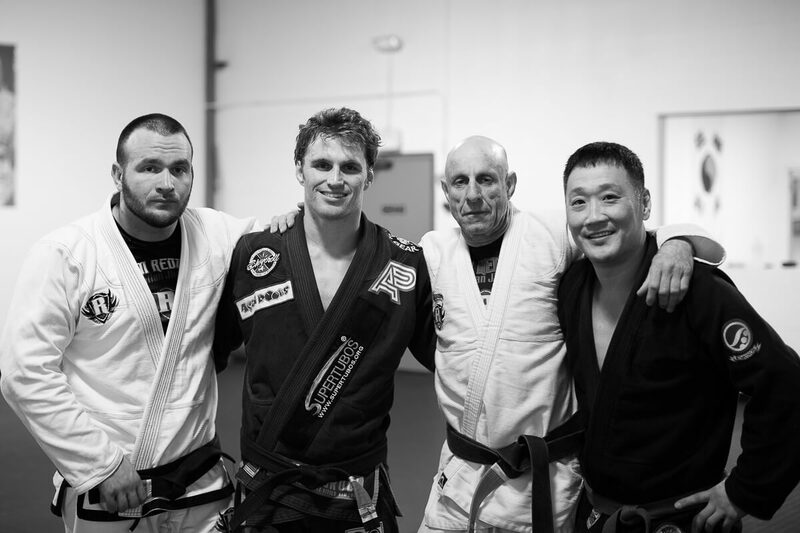 Some of the great fighters and instructors who have graced the mats at Team Redzovic include; Royce Gracie, Ralph Gracie, Carley Gracie, Kron Gracie, Clark Gracie, Rigan Machado, and COUNTLESS others! Team Redzovic is well known for bringing in the best talent to the Mid West. Today the Redzovic family, Eddie, Adem and Idriz are world renown instructors who have built one of the most successful teams in the united states and have taught seminars both nationally and internationally. The Redzovic family are not only certified IBJJF black belt practitioners, but they have also been certified to teach the art directly from Master Carlos Gracie jr.
A foundational art of the sport of Mixed Martial Arts and the U.S. Army’s Modern Army Combatives program, Brazilian Jiu Jitsu is a fun, practical, and increasingly popular martial art. A submission grappling art, Brazilian Jiu Jitsu focuses on taking an opponent down and then using ground grappling to dominate and then submit an attacker with a choke hold or joint lock. Brazilian Jiu Jitsu is an excellent complement for anyone with Judo or Wrestling experience, but is also perfect for the a complete newcomer to submission grappling it teaches universal grappling skills that transfer very well to other disciplines. BJJ is offered for both children and adults and is one of the most popular martial arts for adults to participate in. Fundamentals: A class for both beginners and advance students covering the most used and practical techniques with an eye towards self-defense situations. In this class students will learn some basic striking and distance control on the feet, and how to take down an aggressor down to the ground. On the mat students learn different ways to control their opponent in addition to different transitions and submissions they can use to defeat an attacker. Every fundamentals class involves a warm up, lessons were students are taught techniques and then engage in light drilling. After learn two to three techniques students are then lead through a limited sparring session where they can apply the techniques they learned against a resisting opponent. Advanced: This class focuses on preparing students for the vibrant and quickly growing submission grappling competition scene. Students will learn the more complex techniques being used by champions at the highest levels of competition in Brazilian Jiu Jitsu. The class immediately follows fundamentals and it is encouraged that advanced students attend both classes, so there is no warm up. There is a lesson period of normally a stand up technique and ground technique and then an extended free sparring session. Sunday Class: A Sunday morning review of the techniques covered in the week’s Fundamentals classes. Classes include a warm up, the instructor going back over the week’s classes, a limited sparring session and then an open mat where students can ask questions of advanced, drill together, or open spar. Begin with our Free Trial. (Required. Sorry.) Keep track of our important updates by subscribing to our newsletter: "Yes" "Perhaps Later"